Obviously, the word “image” cannot refer to everything captured by the senses in our current era of screens. We engage with the spectacles on our screens using much more than our eyes; these spectacles require the full participation of the body. The dynamic digital spectacle exported from the screen is imbued with multiple temporal dimensions, which become entwined with the body and shape one another. The digital spectacles’s medium of export and intake is an extension of the body’s senses. Looking is no longer a one-way, static act; every time we take in a spectacle on a screen, our sensory organs become part of their own circulating system. In this intake process, information grows, multiplies, and mutates, is digested or partially absorbed, and is distorted or reconstructed, then bounced back to the organism. At these times, consuming digital spectacles is a production process (such as bullet screens), synchronized and integrated. The functions and technologies of these screens derive a complete set of circulating languages and aesthetic models, imperceptibly informing and guiding users’ tastes and habits. After long periods of interaction, a stable aesthetic is formed, internalized as a way of looking and thinking. These online ways of looking and thinking are used to observe and guide life offline, shaping movements and bodies offline. For example, “faces popular online” (wanghonglian) are produced through the combination of camera angles, self-portrait skills, and later touch-ups to create an online standard of attractiveness characterized by popular yet abnormal facial proportions. With the help of makeup techniques and cosmetic surgery, this standard can be replicated, circulating offline and changing people’s natural faces. The body is governed by the algorithms within technology, and data has started to tame our bodies. Data has tamed our bodies, perceptions, and thoughts; the body has been captured by data and entered into data. 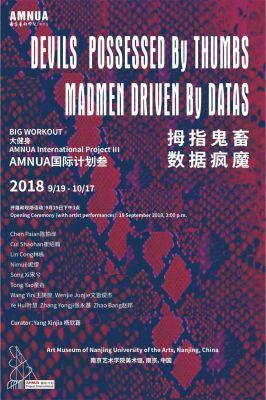 In data networks, the body completes its socialization and identity construction, and bodies that have not been captured by data are fugitives or runaways from data politics. Bodies that have been exiled by data cannot return to the primitive forest, nor can they participate in contemporary society; they are marginalized in a naked state. Socialization is no longer limited to the physical relationships between individuals and between individuals and groups; only when people are coerced into the data-fication of the body can they participate in modern social life. Society today has established a data network that can be precisely manipulated; identity (e.g., ID cards, real-name registration, facial recognition, fingerprint identification, and virtual identities), consumption (e.g., the financial system, mobile payments, online shopping, and the use of third-party platforms), information circulation (e.g., online communities, social media, and news), movements (e.g., transportation and logistics networks), surveillance, and other technologies capture everyone all at once, and individual bodies that have not completed the above data-fication find it difficult to move about in the contemporary moment. The data-fication of people is happening silently, without the individual even realizing it. In the gatherer era, people were tamed by nature. In the agrarian era, people were tamed by the land and tilling. In the machine era, people were tamed by machines. In the algorithm era, people are tamed by data. Different phases in civilization correspond to different bodily functions, cognitive systems, and visions of space and time—which we’ll call the “tense of civilization” for now. For example, we could also see the issue as the understanding and feeling of speed. In the gatherer era, the development of a human’s own four limbs was the reference, and in the agrarian era, people looked to the early tools of horses and horse carts. By the machine age, people’s reference point for speed was the train and the airplane. In the algorithm era, the reference for speed comes from fiberoptic transmission, computing power, and information updating frequency. Compared to the previous three stages of civilization, the algorithm era more often appears in a virtual temporal and spatial dimension, and contemporary bodies not only exist within the tense of the algorithm; they are also situated within the traces and extensions of the “tense of civilization” of the gatherer era, agrarian era, and machine era, within the layering and oscillation of multiple tenses, and within switches between different dimensions of time and space. Contemporary people can never return to a single, integrated tense; functions bequeathed by past tenses gradually disintegrate and disappear. Contemporary people who are placed within multiple layered tenses become fragments floating between different dimensions, and entanglements and divisions have become the norm. Now, we must awaken the ability to smoothly switch between different tenses, fuse clues back together, and produce subjectivity from the fragments.